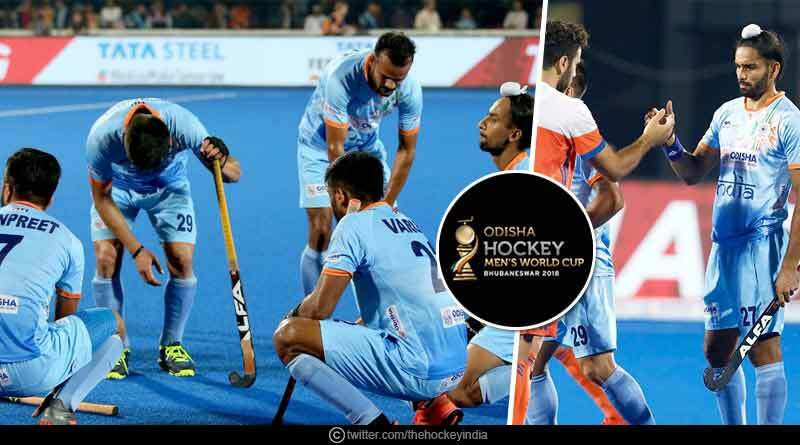 It was heartbreak for the hosts at the Kalinga Stadium with India bowing of the FIH Men’s Hockey World Cup after suffering a 2-1 defeat at the hands of Netherlands. Billed to be India’s best bet to make the semi-finals of hockey’s premier tournament in 43 years, the hosts notorious record of never defeating Netherlands in a hockey world cup match continued after Mink van der Weerden’s fourth-quarter goal gave the visiting side a victory and with it a berth in the final four of the event. As promised, India vs Netherlands hockey match was an action-packed, fast and pacey affair with both sides staying true to the attacking style that had seen them reach the last eight. Unrelenting in their attacks, both sides played some scrumptious hockey while going forward with India ringing the scoreboard first. Akashdeep Singh gave India the lead in the first quarter as the sea of blue leapt with joy as the scoreboard read 1-0 in India’s favour. Moving ahead so quickly in a match of such importance helped alive the dream of making our first semi-final since 1975 when we had gone on to lift our solitary world cup trophy a real one before the Netherlands hit back immediately to find the equaliser soon afterwards. It was a short-lived lead for India, one that lasted just 5 minutes as Thierry Brinkman scored with seconds left for the end of the 1st quarter. Buoyed by their leveller, Netherlands moved up a gear in the second and third quarter, storming India’s castle and pushing them on the back foot for most of the remainder of India vs Netherlands hockey match. While the Netherlands victory was courtesy of their scintillating play in attack, India has no one but themselves to blame for the defeat. Sloppy while in possession, India lost the midfield battle as they gave away the ball far too cheaply. There was no cohesion between the midfield and defence with a lack of positioning letting the Netherlands make circle entries into India’s area with ease, creating chance after chance. In attack also India endured an off day with the front trio looking far from their best. An apt example of this was in the third quarter when a fine cross by Simranjeet lacked the final finish from India with no attacker available to receive it inside the box. Such missed chances and a low turnover conversion rate haunted India against a side who were clearly more experienced than them with a better know-how of how to manage such high-pressure games. The game was won by the Netherlands’ success at winning penalty corners and their well-worked technique at converting them. Provoking India into conceding a PC in the fourth quarter, the visitors made no mistake with Van Der Weerden hitting it dead straight to find his way past the Indian goal-keeper and into the back of the net. From there onwards it was unbelievable stuff from the Indians who went down to 10 men immediately after seeing a yellow card. Pushing for an eequalizer Harmanpreet wore the yellow jersey as India took off their goal-keeper in search of the elusive second goal that would have kept them alive in the match. However, it was never to come and the crowd was stunned into silence with the players’ and spectators faces having morose expressions as the final hooter was sounded to send India out of the tournament. For more articles like India Vs Netherlands Hockey Match, do Subscribe to our newsletter and follow us on Facebook, Twitter, and Google+.